Endless games to be played! Keep kids of all ages occupied in or out of the water with these popular pool toys! Keep kids of all ages occupied in or out of the water with these popular pool toys! Ideal for group play with parachutes and other fun group games. Safe for dodgeball games and indoor classroom activities. Features a multicolored, 6-panel design. Ball dimension listed is the diameter of the ball when uninflated. Pack of 12. Just the right size for my elementary pe classes. The students can get their hands around the ball easily. I was a bit worried when I first received this product because they are on the smaller side but they work great and so far have lasted! I've used these during PE classes and on field day and have not lost one yet. They are very easy to inflate and hold the air for a long time. 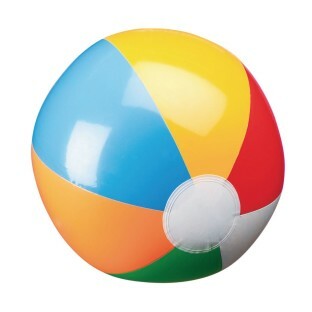 A dozen of these thrown in the pool provides tons of fun. They really held up to the beating my students put on them. The only thing is they are a lot smaller than i expected. They still worked really well though.